People once believed that tooth decay could not be treated or reversed, recent health studies now challenge this premise as wrong. Research in nutrition has linked rejuvenated cavities to improved diet. 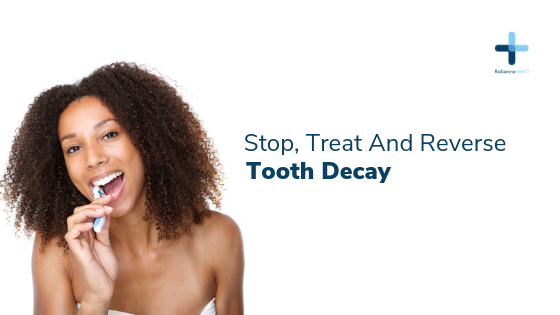 Tooth decay mainly occurs when the teeth is frequently exposed to carbohydrates. Bacteria in the mouth produce acids when consuming carbohydrates, this acid gradually damages the enamel of the tooth. 1. Minerals – Including minerals like calcium, phosphorous and magnesium in your diet will help you develop stronger teeth. Calcium especially strengthens the teeth; you can increase your calcium intake by consuming more yogurt, cheese and milk. 2. Avoid sugar – Try reducing or eliminating sugar from your diet. Sugar is food for bacteria; you can replace sugar with healthier options like honey. 3. Raw dairy products – Consume raw dairy products, they are rich in magnesium, calcium, phosphorus and fat soluble vitamins that are good for the teeth. Milk, butter and cheese are some popular raw dairy foods. 4. Fat soluble vitamins – Deficiency in fat soluble vitamins is a cause of tooth decay. Ensure your diet is rich in fat soluble vitamins. Cod liver oil is a source of vitamins A, D and E.
Consume more broccoli, spinach and bone marrow as sources of vitamin K. Vitamin D can be acquired from eggs, milk and early morning sunshine.